I’m not sure what it’s like where you are, but here in Toronto, it is grey and there is a slushy snow falling from the sky. It’s my day off and after running some errands with Maisy, I’m going to tuck in and do an oddball mixture of sewing and accounting. Hopefully working on my Double Wedding Ring quilt will offset the hours of accounting I have to tackle. 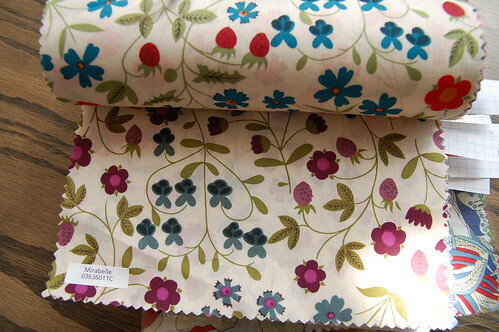 I thought perhaps these photos of the Liberty of London fabrics that I ordered for the shop last week might perk up your day. I have been looking at them constantly, carefully considering what lovely things I might make with them. 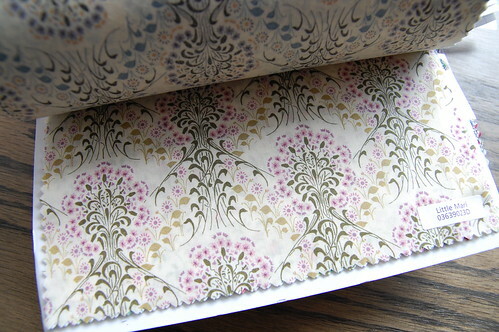 Perhaps you’d like to do a little fabric day dreaming too? This Tana Lawn cotton has a really high thread count and is so lovely to work with. For me, this is a big milestone. 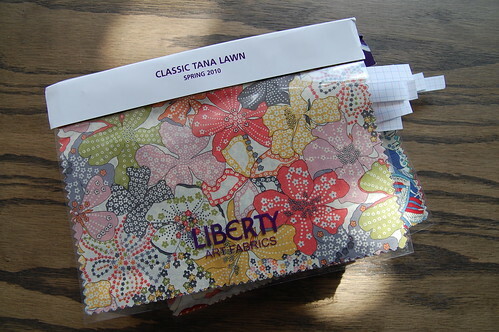 Liberty is the pinnacle of timeless fabric design. Flipping through their swatch books was such an incredibly delicious experience. It is unheard of to see that many amazing prints in one collection. Narrowing my selections down to just six bolts was a bit of torture, but I managed by telling myself that this is just my first order of many more. 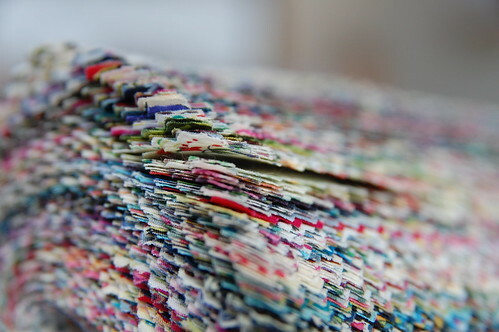 The fabrics don’t arrive until the end of May, so lots of time to imagine the perfect projects for them. Congratulations! This is huge! I can’t wait to move closer to The Workroom so I can more easily stalk your fabric selection! Exclamation points!! I’ll have to show you the hilarious 1980s Liberty dressmaking book I have, while I’m at it (I’ll bring it to the trunk show). PS – I’m rooting for the Mirabelle! It’s a classic. Love the fabric selections. I think you have such a great eye in your selections. oh gosh! you luckyyy girl!!!! 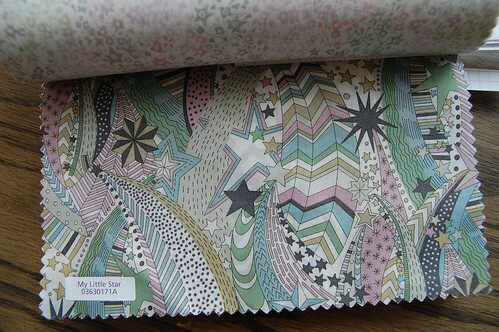 I’m obsessed with little star! I’d love that as a summer skirt!!!! Gah! How did you ever choose? Those are incredible. I especially like the purple one. oh my – this is dangerous. it has always been a dream of mine to own some LoL yardage. i had a brief ebay stalking stint but never won my bids…or they got up to such heights that i just couldn’t justify it. my fave of the workroom stash-to-be has to be tania lawn (i remember bidding on that a couple of times! ), and the berry-like florals. the zain geometrics are pretty great too. congrats karyn…and dotcha wish you had more twilight to read today? i do! Oooh, they’re all so beautiful! I bought a half yard when I was in London last January. Sometimes I just pull it out and look at it…. oh… i am so coveting that little book of liberty goodness! oh my! it’s all so lovely… and i can just feel it on my hands as i look through your photos! gosh… i wish i lived in toronto… or, at least a little bit closer so i could pay you a weekend visit. congrats! so exciting. 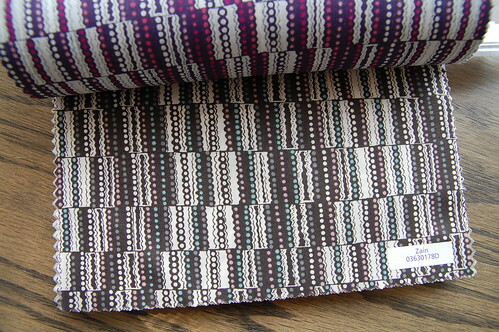 maybe having easier access to tana lawn will inspire me to use the metre i got last year at purl patchwork. i’m doing the sewing/accounting combo as well. Ooh… dresses in Liberty! Imagine yourself strolling around the streets of Paris with a handmade Liberty dress… heaven! are these just samples? Or will they be making an appearance at The Workroom for purchase? Love the stars! I will be waiting at the door when you get these in… along with everyone else! Too too beautiful!! ditto here…it’ll be like staking out for concert tickets! Hey Karen I now you aren’t getting the cover print, but what is the name of it? I’m really trying to find it on line. Thanks! 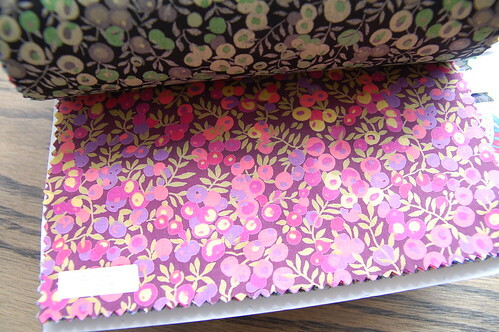 Could you tell me the name of the very first fabric (stylized flowers) on the fabric pile swatch labeled “Classic Tana Lawn Spring 2010”.